We offer the full spectrum of eye care to patients of all ages, from children to seniors including assessing for prescription, ocular health assessments, co-management of corrective laser eye-surgery, immediate attention for eye emergencies and much more. 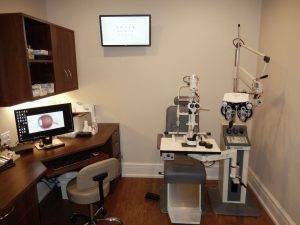 The eye care professionals at Martin Street Optometry provide thorough eye exams to all patients, including special monitoring of macular degeneration, dry eye disease, diabetic retinopathy, glaucoma and cataracts. Learn more about what problems can be spotted with an eye exam, what is involved in a comprehensive exam, and special considerations for kids and contacts. Dr. Klaming treats a wide range of ocular diseases at her Milton eye doctor's office. The most common ocular diseases include Glaucoma, Macular Degeneration, and Cataracts. LASIK surgery can be an alternative to glasses and/or contacts. We provide co-management of LASIK, cataract, and other ocular surgery.